By now, you should know the 2018 Athletics are not the 2017 Twins. The 2017 Twins were a pushover 85-win team that essentially backed into the second wild card spot because the rest of the American League was so bad. The 2018 Athletics won 97 games and, despite playing in the spacious Oakland Coliseum, they finished third in home runs (227) and fourth in runs (851) this season. They are scary. Neither Martini (179 plate appearances) nor Laureano (176 plate appearances) have much playing time, but, in the playing time they do have, they’ve been very good. That was the A’s regular lineup down the stretch in September, and, if manager Bob Melvin sticks with it in the Wild Card Game, they’ll have seven hitters in the lineup with a 117 wRC+ or better. The Yankees will have eight (everyone but Gary Sanchez)! But six is scary. 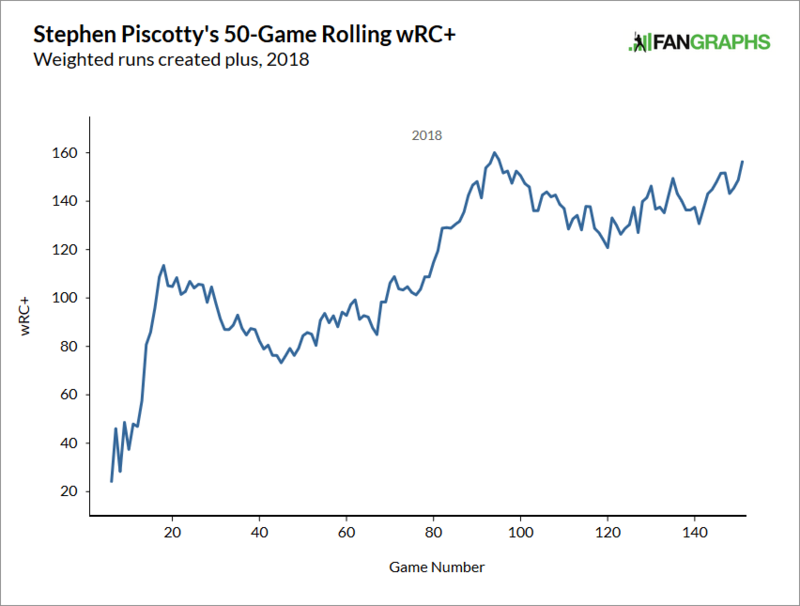 Piscotty is not an out-of-nowhere success story. While with the Cardinals he hit .305/.359/.494 (134 wRC+) in 2015 and .273/.343/.457 (116 wRC+) in 2016. He struggled last season, hitting .235/.342/.367 (91 wRC+) while dealing with a groin injury and also off-the-field family matters. Piscotty’s mother Gretchen battled Lou Gehrig’s disease and passed away earlier this year. I can’t even begin to imagine what that was like for Stephen and his family. After a good but not great first half, Piscotty has really settled in with the Athletics in the second half, adding length to the lineup. He had 41 doubles and 27 home runs in 151 games this season. Nineteen of those doubles and 20 of those home runs came in his final 72 games. Piscotty played at a 40+ homer pace for basically half-a-season there. This dude is feelin’ it right now. Here are two heat maps. 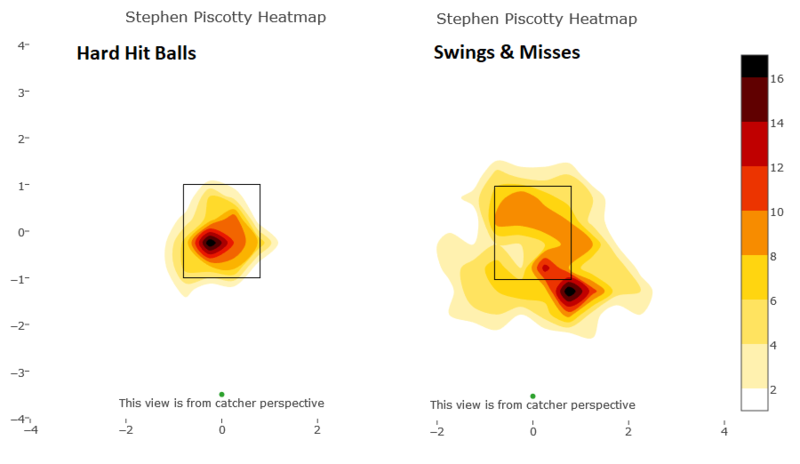 On the left are Piscotty’s hard hit balls this season, specifically fly balls and line drives with a 95 mph exit velocity or better. On the right are his swings and misses. Like most hitters, the down and away pitch is Piscotty’s kryptonite. He’s also not someone who can do damage in any quadrant of the strike zone. For Piscotty to really lay into one, it has to be thigh high and out over the plate, perhaps a little inside. That’s where he makes his best contact. You can kinda see how the red splotch of hard hit balls fits neatly around the swings and misses. Relative to the rest of the league, Piscotty is a better than average hitter against both fastballs and breaking balls. Everyone hits fastballs better than breaking balls — the Yankees didn’t adopt their anti-fastball philosophy on a whim, you know — but Piscotty’s split is rather extreme. As productive as he’s been against fastballs this season — Piscotty had the tenth highest xwOBA against fastballs this year, sandwiched between Joey Votto and Paul Goldschmidt — you can elevate the fastball against Piscotty. The more velocity the better, obviously. That makes Severino a good matchup against Piscotty, in theory. Severino can elevate that upper-90s heater and also break off that nasty slider down and away. Looking at the rest of the bullpen, Chad Green’s strength seems to make up well with Piscotty’s weakness. Green throws a ton of fastballs and most of them are up in the zone. It wouldn’t seem like Green vs. Piscotty is something the Yankees want given Piscotty’s propensity to annihilate fastballs, but, given how Green operates up in the zone, it could work out very well. He just has to execute, of course. At the same time, Zach Britton might not be a good matchup against Piscotty at all. There’s the platoon advantage, for starters, but Britton also gets his outs by pounding the bottom of the zone with sinkers. It’s not a normal sinker. Britton has maybe the best sinker I’ve ever seen. 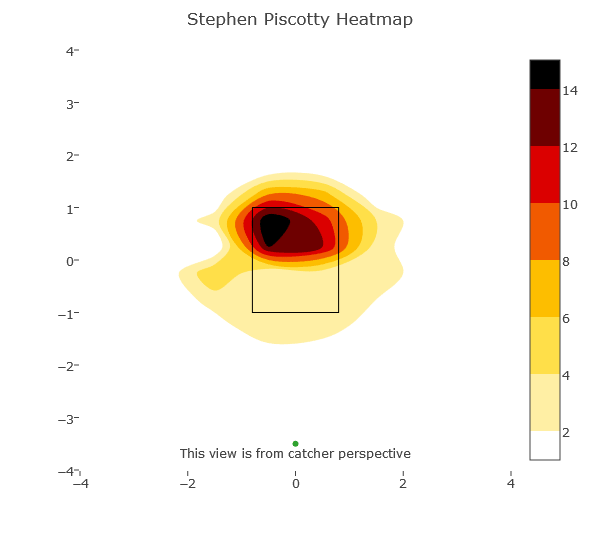 But Piscotty can handle fastballs down and certainly fastballs out over the plate. A righty who can elevate the fastball is a better bet than a lefty who peppers the knees. 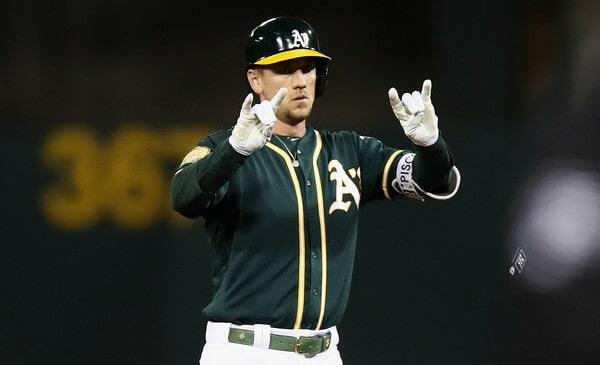 Piscotty has been the A’s most dangerous hitter the last few weeks and, ideally, the Yankees would attack him with breaking balls down and away. All hitters are susceptible to down-and-away breakers. Piscotty especially so. If that matchup isn’t there though, elevated fastballs are the way to go, in which case the fastball heavy Green may be the best option against the fastball crusher Piscotty, as weird as that sounds.